At zero-dark thirty an alarm goes off. Breakfast will be served momentarily, and participants in this year’s Fuerzas Comando competition will head to their respective areas for another day of events to determine whose country has the best commando team. The competition began on July 15 with an opening ceremony hosted by Panama’s Ministry of Public Security. Panamanian National Security Minister Alexis Bethancourt Yau and Army Col. Brian Greata, the deputy commander of Special Operations Command South, spoke during the opening ceremony. Greata highlighted the importance of facing international threats as partners. Following the ceremony, the commandos changed and went to Calzada de Amador, Panama, to start the physical fitness event, which consisted of muscular and cardiovascular endurance. Events included one minute each of pushups, situps and pullups, as well as a four-mile run. These existing partnerships allow participants to exchange experiences and gain new knowledge about their counterparts, their nations, and their cultures. “The competition in Panama this year is an excellent opportunity for us to open doors to the other countries to show them the level we are on,” said Teniente Romuel Ruiz, a Panamanian police officer. Nations competing in Fuerzas Commando 2018 learn from each other and refine their unit tactics. By increasing their special operations capabilities, countries become more capable of confronting common threats. After a short break, Day Two kicked off at midnight with a 20-kilometer ruck march and stress shoot. Commandos rucked through the dark and humid night carrying their assigned weapon and a 55-pound rucksack. When the commandos completed the ruck march, they were given a chance to cut down their times by shooting ten rounds into paper targets. The commandos from Haiti were the first team back, but placed 10th overall at the end of the day. Day Three and Four of the competition consisted of sniper ranges and assault courses. The 17 countries each split their representatives into two teams, a sniper and assault team, which competed simultaneously at several locations to determine who could shoot more accurately in the shortest amount of time. 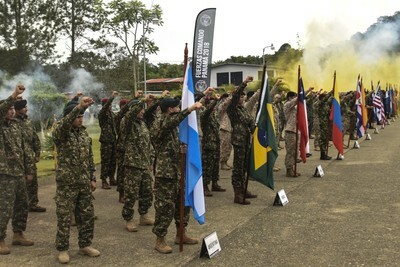 After two long days at the range, the commando team from Colombia had taken first place and were looking to win their 9th competition after holding the trophy between 2005-2008 and 2012-2016. They were ahead of their closest opponent, Ecuador, by 165 points. Asimbaya added that the competition was significant to his team. They train on a daily basis back in Ecuador, he said, and look forward to sharing knowledge with the other 16 teams to become better, not only for the competition, but to help fight the war on terrorism. Two more critical events are scheduled in the competition. The obstacle course is slated for today, and the water event for July 24. Each event could significantly impact the outcome of the competition.